We probably should have been doing something useful in the garden this week, especially today with the wonderful autumn sunshine. However we got distracted. 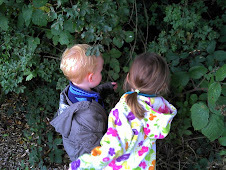 You see Garden Girl has been learning all about her senses at nursery school this week. So when we went out into the garden with all the very best intentions and got a lovely waft of the hundreds of tomatoes we really ought to pick I was inspired to take my Little Garden Helpers on a sensory tour of the garden. I blindfolded Garden Girl and guided her to various parts of the garden where she was under instructions to take a deep sniff and see if she could guess what she was standing in front of using her sense of smell. Garden Boy protested when I tried to blindfold him so instead he agreed to offer clues to Garden Girl if she was struggling to guess. The herb bed was our first port of call where she guessed Lavender and Rosemary with no problems. She eventually guessed oregano when I gave her the clue pizza. Garden Boy's clue of pointing at it and saying 'It that,' strangely didn't help. We also tasted many things without looking. Garden Boy was quite a bit more eager to close his eyes when the offer was food! We tasted tomatoes, loads of herbs, one of our tiny carrots and cucumber. And just for fun I threw in a spoonful of chocolate spread which was met with the response 'That's not from the garden silly' and 'more, please'. I will leave it to you to figure out which was Garden Girl and which was Garden Boy! Using the sense of touch in the garden was by far the most fun and by far the messiest. We felt dry soil and wet soil, water, leaves, flowers, stones, sticks, vegetables, garden tools, smooth wooden beds and rough wooden fences. We talked about the shapes we were feeling and whether things were soft, hard, rough or smooth. Garden Boy loved this and was really engaged by the activity but after touching the wet soil and thinking it was some sort of horrible slime Garden Girl was a bit more tentative. Using our eyes was also a great way for Garden Boy to explore the garden as he loves to show off his knowledge of colours and shapes and there is so much to see outdoors. I sent them off with little tasks, such as 'find three red things' or 'bring back something round'. They raced around trying to be the first one to find things which usually involved Garden Boy running around in circles on the spot, flapping his arms, for a few minutes before he finally ran off in a then surprisingly decisive direction. I left listening till last as it was a good one to calm them down after all the excitement. As we walked back to the patio we listened to the different sound our feet made on different surfaces then we sat quietly and listened to the leaves in the wind, the birds in the trees, people behind the house talking, a baby crying and cars brumming. Garden Lass looked all around her, watching from her perch in my arms my the whole time soaking up the sights, smells and sounds of the garden, learning with all her senses as babies do, until she fell asleep in time to sit quietly on the patio. What a wonderful idea! I'd love to try this with my kiddos ... thanks for sharing! Wow such a fun thing to do. I do need to spend time with my boys but have been busy with my studies lately. Garden boy is a very adventureous boy. Im inviting you to a gardening game where your post tell us who invited you, then list down 10 things you love to do and lastly invite 10 other bloggers to this game. Have fun!